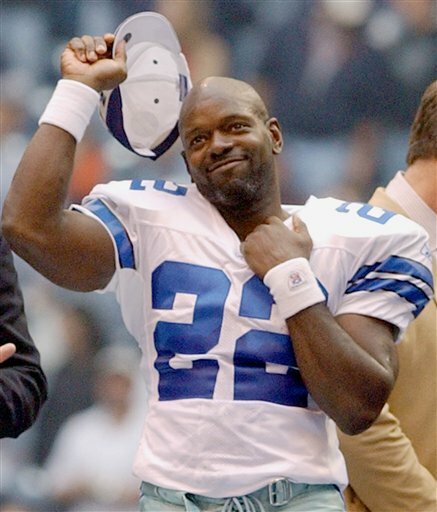 Emmitt James Smith III was born on the 15th May 1969 in Pensacola, Florida USA. The world knows him simply as Emmitt Smith, now a retired NFL player, but during his active time he left quite a mark on the game; he won three Super Bowl Champion titles, and appeared eight times in Pro Bowl games, just to mention a few of his numerous accomplishments. Have you ever wondered how rich Emmitt Smith is? According to sources, it is estimated that Emmitt`s overall net worth is $18 million, an amount acquired through his successful football career, however, after retirement, he entered the real estate business, which has also benefited his net worth. Emmitt grew up in Pensacola where he attended the Escambia High School, and while there he fell in love with football, playing in the position of running back. He led his team to the state championship title, and for those efforts, Smith was named Player of the Year in 1986,by the Parade and USA Today magazines. He then enrolled at the University Of Florida, where he continued to dominate on football fields. During his college career he won numerous awards, including a place in the All-American team, and an induction into the Gator Football Ring of Honor. Emmitt`s professional career began when he was selected by the Dallas Cowboys from the 17th position in the 1990 NFL Draft. From the time he first entered the field, the Cowboys knew that they hadn’t made a wrong decision by drafting Emmitt, as he proved to be a real deal. In his first season, he won the NFL Offensive Rookie Of The Year award, rushing for more than 1000 yards. He continued in the same fashion for the next 10 seasons, and with 2001 season’s 1021 rushing yards, he became the first player to have more than 1000 yards in 11 consecutive seasons. Smith stayed in Dallas, for 12 seasons, and became one of the most successful players in the history of the franchise; he had eight Pro-Bowl appearances, 1990-1995 and 1998 and 1999. He won three Championship rings with the Dallas Cowboys, in 1993, 1994 and 1996, and was named the MVP of the 1993 Super Bowl. While playing for the Dallas, his net worth increased to a large degree, as his game became better and better, and the contract he had signed became greater and greater. To speak further of his accomplishments, Smith is a four times NFL rushing leader in respective seasons of 1991-1993 and 1995. He was named four times All Pro from 1992-1995, and he earned a place on the 1990s All-Decade Team. In 2002, he broke Walter Payton’s rushing record to become the leading rusher in NFL history. Smith spent the last two seasons of his career with the Arizona Cardinals, but three days before the Superbowl in 2005, announced that he would retire at the end of the season, and as a result, he was released from the Arizona Cardinals, but Smith wanted to retire as a Cowboy and signed a one-day contract with the team. Emmitt was inducted into the Pro Football Hall Of Fame in 2010. Smith has also been recognized off the football fields, as he was a participant in the popular TV show “Dancing With The Stars”, finishing as a winner of the competition, which also added to his net worth. Additionally Smith has worked as an analyst on the NFL Network program “NFL Total Access” in 2005, and has also provided his services to the ESPN`s NFL pre game coverage, alongside Mike Ditka, Chris Mortensen, and Tom Jackson. Regarding his personal life, he has been married to Patricia Southall, a former beauty queen, since 2000. The couple has two children, son Emmitt IV and daughter Skylar. 1 Inducted into the Dallas Cowboys Ring of Honor in 2005. 2 Running back on the University of Florida's football team, 1987-1989. 3 Inducted into the Florida Sports Hall of Fame in 2006. 4 Inducted into the College Football Hall of Fame in 2006. 5 Selected 17th in the first round of the 1990 NFL draft by the Dallas Cowboys. 9 Inducted into the ESPN Dallas Hall of Fame in 2011 (inaugural class) with Nolan Ryan, Tom Landry, Troy Aikman, and Roger Staubach. 10 Was MVP for Super Bowl XXVIII. 11 Inducted into the Pro Football Hall of Fame in 2010. 12 Smith almost didn't become a Dallas Cowboy. Dallas had already traded for speedy running back Terrance Flagler, and then-coach Jimmy Johnson wanted to use Dallas' first-round pick that season (acquired from Minnesota in the Herschel Walker trade) to draft a defensive back. However, both backs Johnson wanted were taken before Dallas picked. Johnson, reminded that Smith was still available on the board, expressed a reluctance for several reasons: Smith was short, slow and always carried the ball in his left hand (making him more susceptible to costly fumbles since running backs often switch hands depending on where they're running). But one of Dallas' scouts, who'd observed Smith at Escambia High School and at the University of Florida, said this to Johnson: "This kid broke every high school rushing record in the state of Florida. He can block, catch passes and I've never seen him caught from behind. You HAVE to take him". Smith was drafted by Dallas, and the rest is history. 13 Played two quarters of a playoff game against the New York Giants with a separated shoulder. John Madden called it the most courageous performance he'd ever seen. 14 Began playing football at the Salvation Army as a young child. 15 His wife, Pat Smith, is the ex-wife of actor Martin Lawrence. 16 All-Time Leader on NFL Rushing Touchdowns List (164). 17 Ranks 93rd on NFL All-Time Rushing Average List (4.163). 18 All-Time Leader on NFL Rushing Yardage List (18,355). 19 All-Time Leader on NFL Rushing Attempts List (4,409). 20 Member of Phi Beta Sigma Fraternity, Inc.
21 Dallas Cowboys All-Time Scoring Leader (986 points). 22 Dallas Cowboys All-Time Rushing Leader (17,162 yards). 24 Has a daughter, Regan Smith, by ex-girlfriend Hope Wilson, and a son, Emmitt Smith Jr. (aka Emmitt James Smith IV), by his wife, Pat Smith. 25 [27 October 2002] Passed the late Walter Payton as the leading RB in NFL history. As of the end of the 2002 regular season, Smith has rushed for 17,162 yards on 4,052 carries and scored 153 TDs. 26 [27 February 2003] Rather than put owner Jerry Jones in the awkward position of cutting him, Smith volunteered to be released by the Dallas Cowboys after 13 seasons. He will be paid $4.9 million by the Cowboys, which will count against next season's salary cap. 27 Son Emmitt Smith Jr. born on May 15, 2002; weighed 6 lbs. 5 oz. at birth.